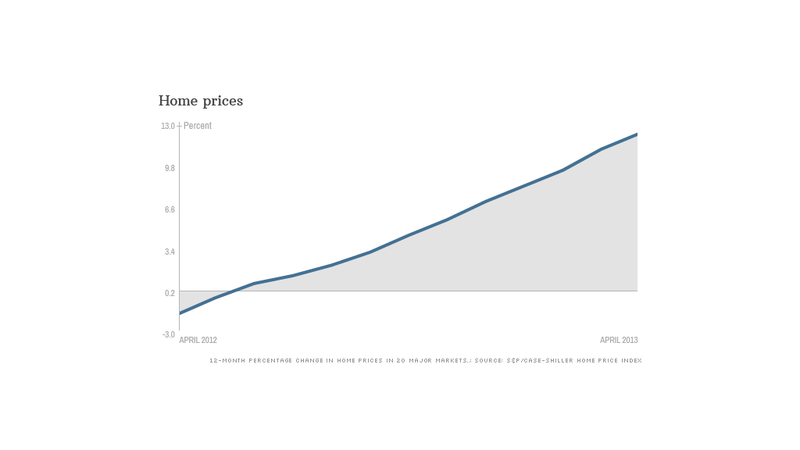 Increases in home prices have been accelerating steadily over the last year. The housing recovery continues to pick up steam, as home prices jumped in April, and new home sales hit a five year high in May. But a recent increase in mortgage rates could soon put the brakes on housing. The S&P/Case-Shiller home price index was up 12.1% in April, compared to a year ago, in the 20 top real estate markets across the nation. That was the biggest annual jump in prices in seven years. Prices climbed 2.5% from March, posting the biggest one-month rise in the 12-year history of the index. New homes sold at an annual pace of 476,000 in May, according to a separate government report. That's the best reading since July 2008, just before the global financial meltdown slashed homebuyers' access to credit. The pace of sales was up 2.1% from April, and up 29% from a year ago. A drop in foreclosures, coupled with a tight supply of homes for sale and mortgage rates that hit record lows, have fueled the rebound in housing over the last 11 months. But the 30-year mortgage rate has risen to nearly 4%, up from 3.35% at the start of May. While that is still low by historical standards, it's trimmed about $12,000 off of an average buyer's purchasing power. Mortgage rates began to climb in May, after April's sharp jump in home prices was recorded. "Home value appreciation in some of these areas will have to slow down, or potentially fall, as higher prices are no longer masked by rock-bottom mortgage rates," said Stan Humphries, chief economist of home price tracker Zillow. Indeed, the rapid rise in home prices that's fueling the housing recovery could actually help derail it, as it makes purchases more difficult for potential buyers. 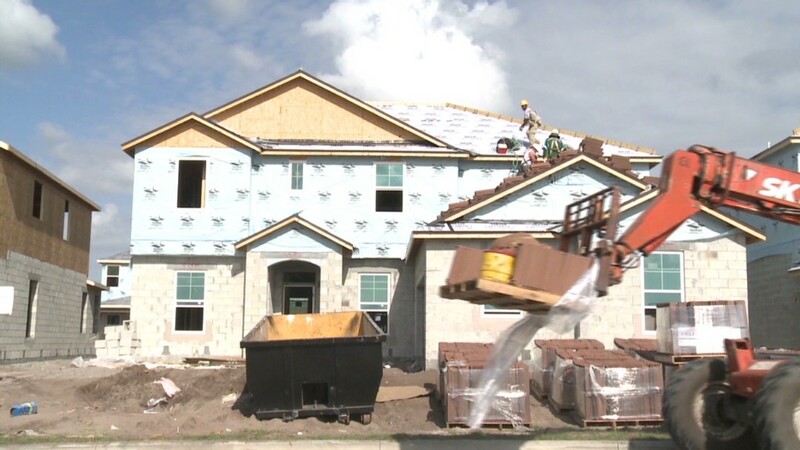 Even the National Association of Realtors warned last week that "home price growth is too fast," and said that the market needs significantly more home building and better access to credit for buyers. Related: Is a neighbor hurting your home's value? "In general, the national housing recovery is strong and sustainable, but pockets of volatility will emerge," said Humphries. "Buyers expecting home values to continue rising at this pace indefinitely may be in for a shock." Still, higher costs for home buyers shouldn't derail the recent recovery, according to Joseph LaVorngna, chief U.S. economist at Deutsche Bank. "Affordability remains near historic highs, despite the recent rise in rates and home prices," he said. And while banks might be charging higher rates, they are likely to ease lending standards for mortgages due to the stronger prices. That should make it easier for some buyers to qualify for home loans.